Electric vehicles are not mere science projects of big automobile conglomerates anymore. They are the future! And guess what, the future is already here. With the advent of exclusieve electric car manufacturers like Tesla, it is now established that the future of automobile technology is electric vehicles. Indian companies like Mahindra with their Reva cars has already started mass production of electric cars for daily use. So now the question that arises is, should you go for one? 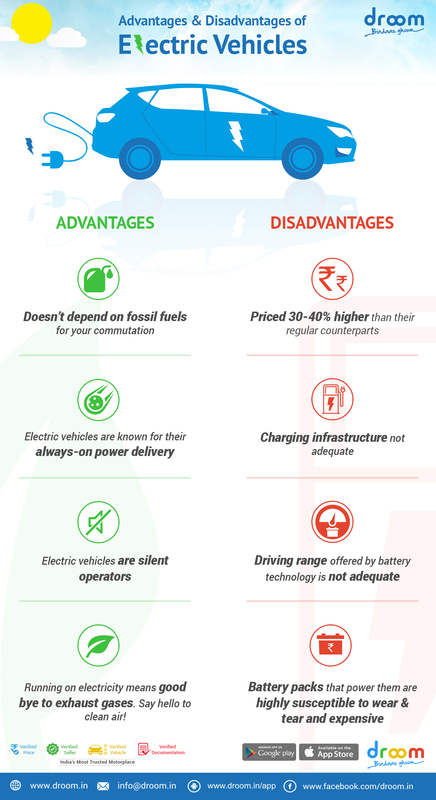 Below is an infograph detailing some advantages and disadvantages of electric vehicles. One cannot deny the technological achievement demonstrated by electric cars, but in the same time one cannot also accept that the technology is ready for mainstream use. Electric cars have still a long way to go to replace their conventional counterparts. But as they say, Rome wasn’t built in a day! Droom Quick Sell: Make Buying & Selling Automobile Simple!